Within the ancient book of Job there are keys to inner healing. Traditionally, the book of Job is read as an account of suffering. But Teresa Liebscher, co-founder of Sozo, invites you to see this ancient Biblical text as an invitation to powerful inner healing through defeating the enemy's lies and maintaining strong connection with God. As you encounter Job through this revelatory lens, you will experience healing from past hurts and become positioned to face any trial with God's supernatural power and divine perspective! Identify and reject strategic lies the enemy uses during difficult times. Recognize the difference between godly counsel and ungodly opinions in people who give advice during hard times. Strengthen your connection with God instead of running away from Him during challenges. Receive freedom from religious deceptions such as "God sends pain to fix us" and "suffering is directly linked to our sins." Discover the path through suffering, and embrace wholeness on the other side! 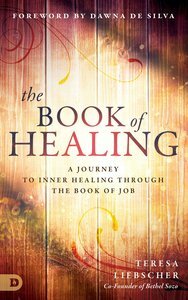 Unlock your healing within the book of Job! About "The Book of Healing"